Food Politics is one of my favorite blogs out there. It addresses the business that the food we eat truly is. Marion Nestle suggested a great read on her blog today about the development of Urban Food Policy – it’s about time. 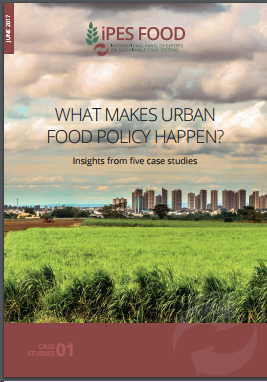 Enjoy her brief blog post and links and pick up the book “What Makes Urban Food Policy Happen?” that highlights five successful urban policy case studies from around the world. This book is a must read for those (like me) who want to create an Urban Food Policy in every town – rethinking the way we grow, transport, process and buy food. Next Post Inspirational Saturday ~ How Long Are You Sitting Still?